How do you make triangles the easy way? Thread: How do you make triangles the easy way? I like the method of putting 2 squares together, drawing a diagonal line and stitching 1/4" on either side, cut apart and 2 half square triangles blocks. I always oversize so I can trim to the size I need. This is what I do as well. The 'correct' way is to upsize your squares by 7/8" from the desired finished size of your block. I usually do the full inch so I have room to trim up. Feel 'wasting' the 1/8" is far better than re-doing because of wonky squares. I'm a 1 inch kind of girl, too. I hate working with 1/8" anyway and somehow, I always need to square up a bit. When I have a really large amount of HST's to make I use something like Thangles. They seem to go quicker without a lot of putsy work. Layer 2 fat quarters right sides together. Draw a grid of squares on the lighter color fat quarter, making the grid be 1" larger than the size of HST you will need. 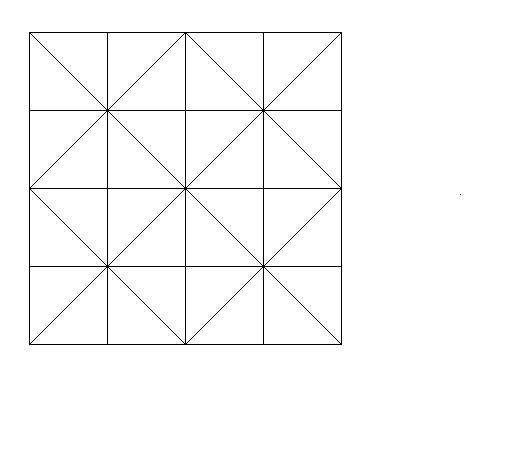 Draw diagonal lines through the grid so that each square has ONE diagonal line in it. Sew 1'4" away from EACH side of EACH diagonal line. Press the fat quarters after sewing. Cut apart on EVERY DRAWN LINE. Last edited by Jan in VA; 07-20-2013 at 10:50 AM. More Hst is better! Great ideas! This is the method I use.. several older quilt books have this and you can make more or less and bias is not a problem. the grid Jan has made will make 32 hst squares and there is a way to start at one point and continue sewing with out stopping until you have sewn on both sides of the diagonal lines.. l love this method..beats every other method I have ever tried. Boston squares can be made by using a half sqt. on top of a hst. square, matching corners and trimming the under neath hst sq. You will have a smaller (2 color) triangle piece left over.. I just do it like NJ Quilter does it. Jenny Doan of Missouri Star Quilt Co. has a tutorial on it. I like using the Thangles. I have drawn my own grids, but they aren't as accurate as the ones you can purchase. I haven't tried any of the other papers. I hate having to square up, and would rather make them the right size the first time. Yep, this is how I do it, works for me, and I like being able to square them up. Jcrow, are you wanting to make triangles or half square triangles? Your OP says triangles. Thanks so much Jan in VA. You always have such succinctly prepared responses. And of course thanks to all of you who responded. This forum is terrific and all of you members are a daily inspiration. Thanks oldcatlady, that site is awesome ! Jenny Doan of Missouri Quilt Company has a lot of great tutorials on making blocks with HST's and she shows various methods on how to cut them. I will stick to my triangulations. Much cheaper than thangles, you only buy the CD once and you are good to go for any size HST. It sure made my quilting a whole lot easier.I mean quilt sewing, not the quilting. I use this method, too, although I hate tearing the paper off. (need to get some pulp paper). 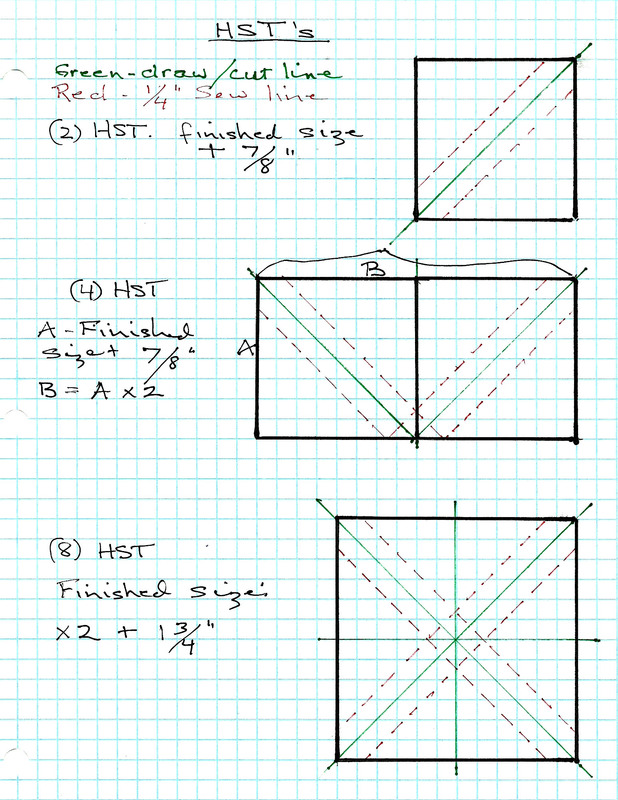 This paper method produces the most accurate HSTs, I've found.